A HH-60G Pave Hawk is off-loaded from a C-5M Super Galaxy on May 30, 2016, at Camp Lemonnier, Djibouti. During its mission while circumnavigating the world, this C-5M transported more than 580,000 pounds of cargo and nearly 400 passengers. In 1873, Phileas Fogg, the fictional protagonist in Jules Verne’s “Around the World in Eighty Days” circumnavigated the globe by rail and steamer ship in, of course, 80 days. Unfortunately for Fogg, he did not have access to a C-5M Super Galaxy to accomplish this feat quicker. A C-5M aircrew from the 9th Airlift Squadron at Dover Air Force Base, Del., completed an east to west circumnavigation of the globe May 21 to June 3. Over the course of two weeks, this mission saw the C-5M and its aircrew transport and deliver more than 580,000 pounds of cargo and nearly 400 passengers. The aircraft visited and transited military bases and locales to include Joint Base McGuire-Dix-Lakehurst; Joint Base Pearl Harbor-Hickam, Hawaii; Kadena Air Base, Japan; Naval Support Facility Diego Garcia, British Indian Ocean Territory; Camp Lemonnier, Djibouti; Naval Station Rota, Spain; Davis-Monthan AFB, Ariz.; and back home to Dover AFB. In total, the mission racked up 69 hours of flight time and traversed more than 26,000 miles. Though this is not the first time, nor will it be the last time a C-5M has accomplished this, it is still a feat well worth mentioning. The aircraft commander, Capt. Braden Gross, had nothing but praise for his aircrew and the mission. A HH-60G Pave Hawk is off-loaded from a C-5M Super Galaxy on May 30, 2016, at Camp Lemonnier, Djibouti. 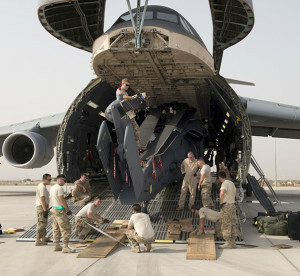 The C-5M is the largest outsized cargo transport aircraft operated by the U.S. Air Force. For one veteran aircrew member, TSgt. Will Russell, a 9th AS loadmaster evaluator with more than nine years of flight experience and more than 2,700 flight hours, this was finally his first time circumnavigating the globe. Even with the great length in time and distance attributed to this circumnavigation, Russell and his fellow loadmasters overcame all unique difficulties. 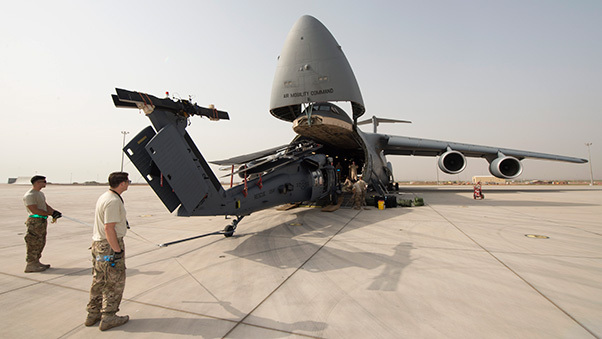 During this specific mission, Russell and three other loadmasters were responsible for loading and unloading hundreds of thousands of pounds of cargo, to include two HH-60G Pave Hawk helicopters, four military-grade Polaris RZRs, three jet skis, and dozens of pallets. Russell was pleased with the dedication and professionalism of the younger loadmasters he supervised. Airman 1st Class Leah Peterson, a 9th Airlift Squadron loadmaster, goes over preflight procedures prior to takeoff May 23, 2016, inside a C-5M Super Galaxy on Joint Base Pearl Harbor-Hickam, Hawaii. A 9th AS aircrew circumnavigated the globe in 14 days. But keeping the C-5M in the air safely was the responsibility of the two flight engineers who are responsible for maintaining and monitoring the aircraft’s systems. 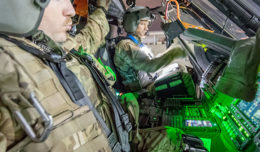 Maintaining the aircraft’s systems and mechanical workings fell to the responsibility of two flying crew chiefs from the 436th Aircraft Maintenance Squadron. For one of them, SSgt. Bradley Harris, this wasn’t his first rodeo. 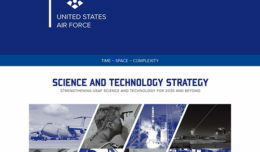 Besides some standard mechanical issues, the flying crew chiefs and flight engineers were able to overcome all adversities, allowing the mission to continue on schedule successfully. 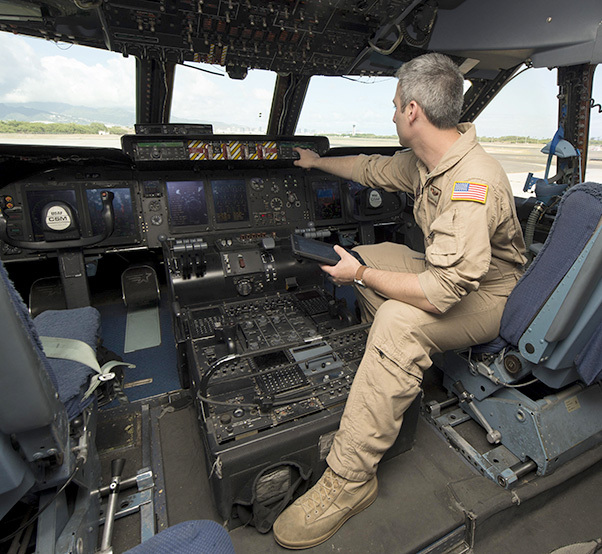 Senior Airman Dominick Lignelli, a 9th Airlift Squadron flight engineer, conducts preflight procedures prior to takeoff May 23, 2016, inside a C-5M Super Galaxy’s flight deck on Joint Base Pearl Harbor-Hickam, Hawaii. 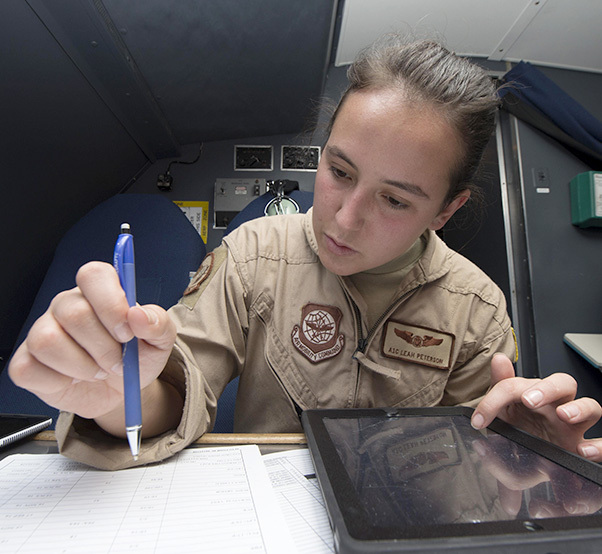 Flight engineers are responsible for operating, monitoring and maintaining an aircraft’s systems while in flight.